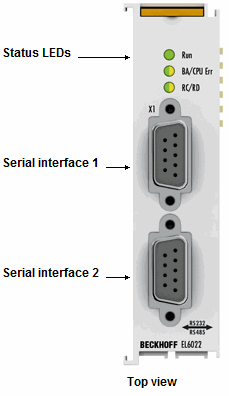 The EL6002 and EL6022 serial interfaces enable the connection of devices with two RS232 or two RS422/RS485 interfaces. The devices connected to the EL6002/EL6022 EtherCAT Terminals communicate with the automation device via the Coupler. The active communication channel operates independently of the higher-level EtherCAT system in full duplex mode with 300 baud up to 115.2 kbaud. The RS232/RS422/RS485 interfaces guarantee high interference immunity through electrically isolated signals. The EL6022 can provide 2 x 5 V/20 mA out of the E-bus supply (electrically isolated, short-circuit-proof) for the supply of external devices. In conjunction with the TwinCAT Virtual Serial COM Driver, the EL60xx can be used as a normal Windows COM interface.